This project turned out so cute. It would make an adorable pin, magnet, or purse embellishment, and it was really easy. If you don't have the embroidery design, don't worry. There is a fee link below, good through November! I used my AccuQuilt GO!, the Fun Flower die, and a coordinating embroidery design by Sarah Vedeler called GO! Bloom. 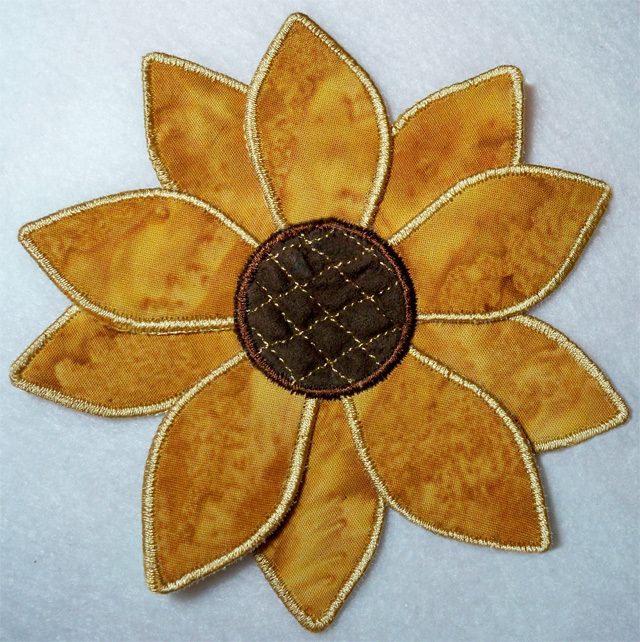 Then, I used Texture Magic by Superior Threads, and made the middle of the sunflower dimensional, adding a realistic look to the finished product. Once texturized, everything is done in the hoop with machine applique, creating a stand-alone piece. You can alter the design in editing software as I did, or you can simply advance through color changes in the design to stich only what you need. 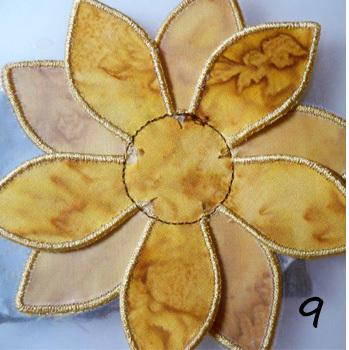 For this project, you need a placement stitch for the petals, satin stitches for the petals, and placement stitches, tack-down stitches, and finishing stitches on the flower's middle circle. 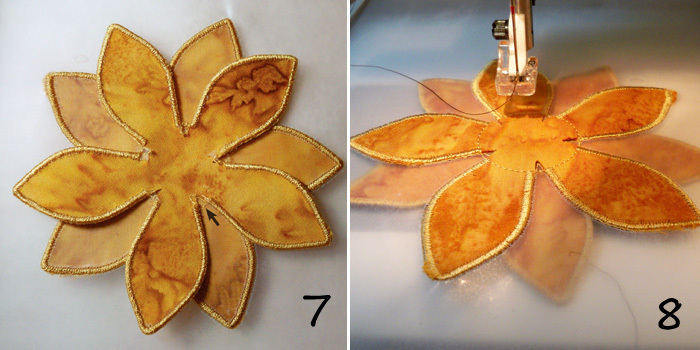 Start by ironing the sunflower petal fabric. I chose a beautiful watercolor batik. Cut four squares slightly larger than the die petal size. Iron a fusible web product to the backs of two squares according to manufacturer instructions. 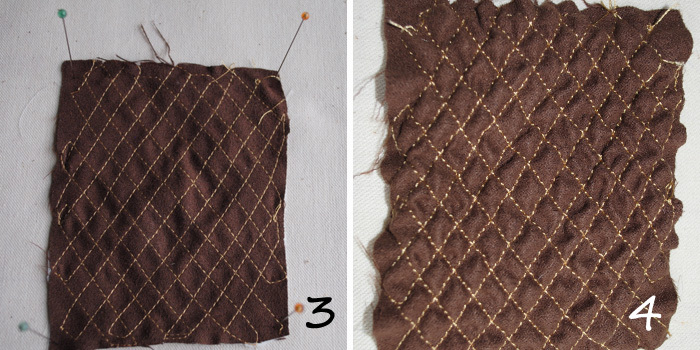 Then, fuse the two plain fabrics to the two fused fabrics creating a petal sandwich. 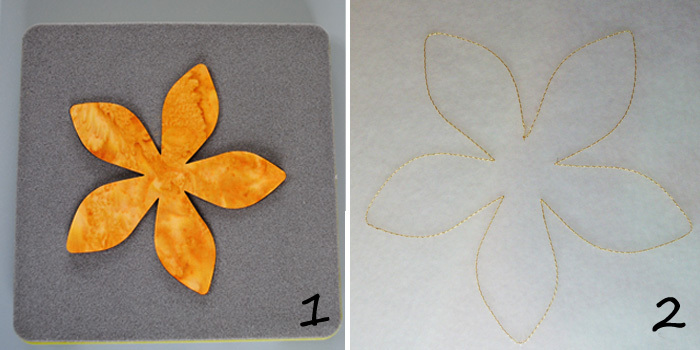 Although you can make this flower with one layer of fabric, two layers give it a more substantial feel. Run all four layers through the die and you have two double-sided petal units. Bottom Petals: Hoop a water-soluble stabilizer (WSS), like Sulky Ultra Solvy or Badgemaster. Because both sides of the petals will be seen, use the same thread color in the bobbin as that with which you are stitching. Stitch out the placement stitches. Spray one side of a fused petal set with temporary spray adhesive. Spray in a box or on a sheet of paper away from the machine. Never spray in the hoop. Finger-press the shape inside the placement lines. Stitch the satin stitches. Remove the WSS by carefully tearing it away from the petals. Satin stitching helps to perforate the WSS making it easy to remove. A seam ripper helps separate WSS from the petals on the back side. You can also clip excess WSS with small scissors, rinse it away, and let the piece dry flat if preferred. 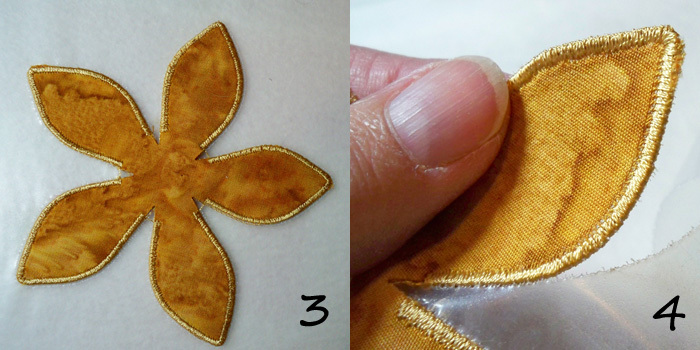 Top Petals: Hoop WSS and stitch out the placement and satin stitches. Keep everything in the hoop and stitch the placement stitch for the center of the sunflower. Spray one side of the bottom petals with temporary spray adhesive. On the back of the still-hooped top petals, place the bottom petals so that they align opposite those in the hoop. Because the center applique of the flower is also satin stitched, petal stitching only goes as far as the center circle. 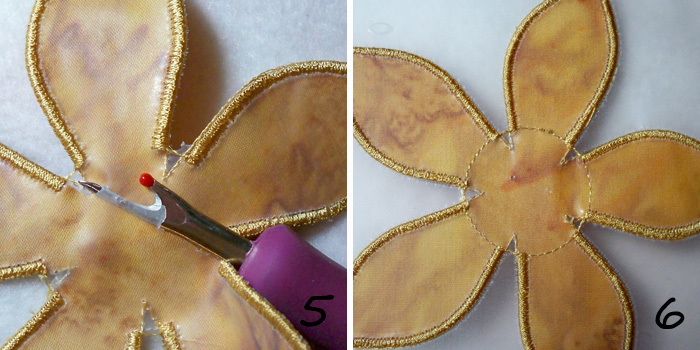 Be sure to keep unfinished areas of the bottom petals within the circle stitched on the hooped petals (see arrow). That way they will be covered with the center applique. Carefully re-attach your hoop making sure the bottom petals are flat against the hoop. Run the center tack-down stitch again to secure the back petals to the hooped front petals. I've had Texture Magic for quite some time and finally decided try it out. It is one of those products that you will probably find many uses for it once tried. Superior Threads has a couple dozen videos on their site showing techniques and uses for Texture Magic. Texture Magic looks like white nylon and, when steamed with an iron, it shrinks up to 30 percent of original size. 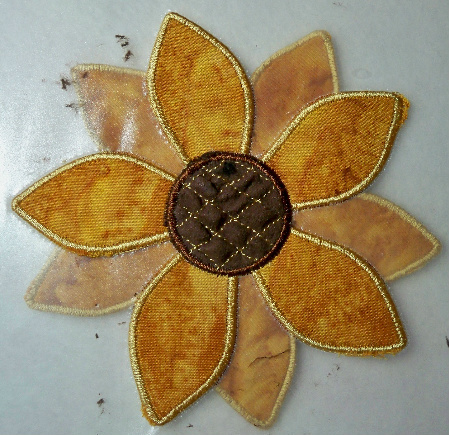 I used a piece of mole skin (aka, suedecloth, faux suede) for the center of my sunflower so it would appear more realistic. Sandwich a piece of Texture Magic with the back of the fabric to be texturized. Stitch the two together. I used a diagonal grid and the same color thread as the petal satin stitches so it would stand out. The stitching doesn't have to be perfect as it will distort when steamed. As recommended in a product video, I tacked all four corners to my pressing board with straight pins and steamed to the desired texture. The result is a lovely dimensional fabric that will work perfectly as the center of my sunflower. Place the texturized fabric over the center of the flower and run the placement stitch again (I ran mine twice) to secure it to the hooped petals. Texturized fabric has peaks and valleys that will release when cut as an applique. It is recommended that the applique shape be traced on texturized fabric and stitched along the line by machine before cutting. 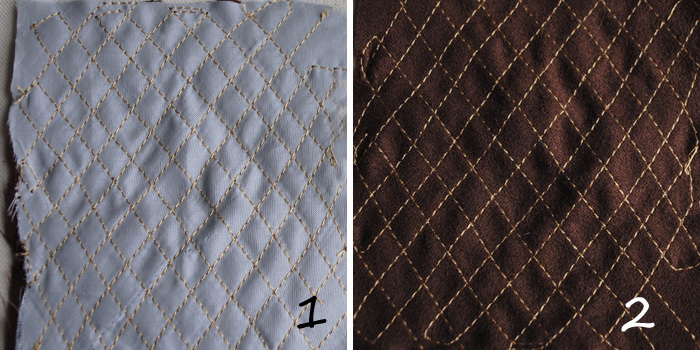 With embroidery designs, the placement or tack-down stitch takes care of this problem. Remove the hoop from the machine but keep everything in the hoop. Trim the texturized fabric to the center placement stitching. Re-attach the hoop to the machine and run the finishing satin stitch. Note: With the free design linked above, the center circle is finished with snowball type stitches rather than satin stitches. When finished, remove everything from the hoop, carefully remove the final WSS, and enjoy! Love the texture magic in the center. I have never used the stuff myself, but have admired it from afar. The link is not for the sunflower. It is for a table runner flower. Too bad. The table runner flower design can be used to create the sunflower. Same AccuQuilt flower design. Just use the color stops noted. You should try TextureMagic. Once you do, you will see many other uses!